If you would like to enter to win a Wild Republic Nene Goose or one of the other two prizes enter your email in the comment section below. Winners will be chosen on Sunday August 29th!! The Nene has endured a long struggle against extinction. During the 1940s, this beautiful species was almost wiped out by laws which allowed the birds to be hunted during their winter breeding seasons when the birds were the most vulnerable. 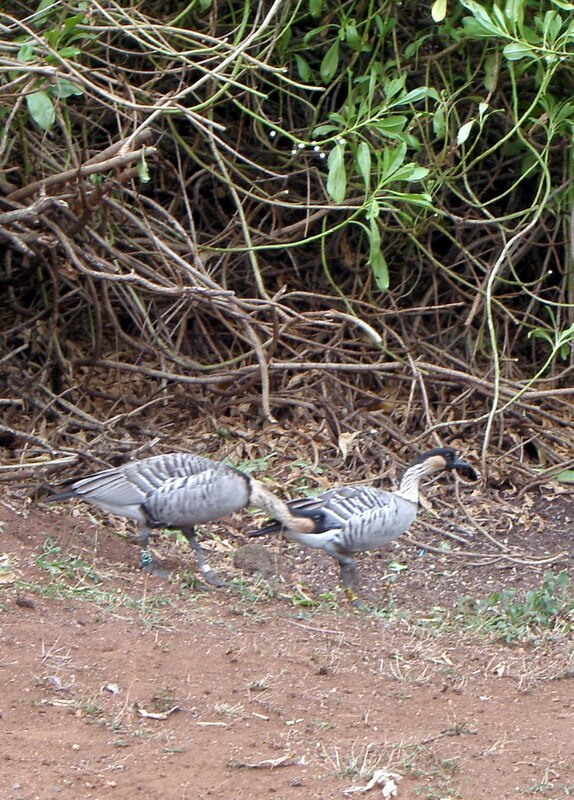 By 1957, when the Nene was named as Hawaii’s State Bird, rescue efforts were underway. Conservationists began breeding the birds in captivity in hopes of preserving a remnant of the declining population and, someday, successfully re-establishing them in their native habitat. Early programs for returning captive-bred birds to the wild proved difficult, but recent efforts have been very successful. 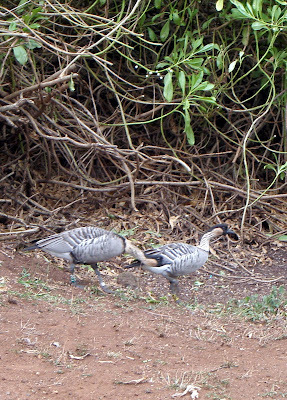 There are now small but stable populations of Nene on the islands of Hawai'i, Maui, and Kaua'i. According to the Hawai'i Audubon Society, the Nene, currently on the Federal List of Endangered Species, is threatened today by introduced mongooses and feral dogs and cats which relentlessly prey upon the Nene's eggs and young. Preservation efforts are continuing and the success of the Nene in Hawai'i, although not a certainty, is promising. 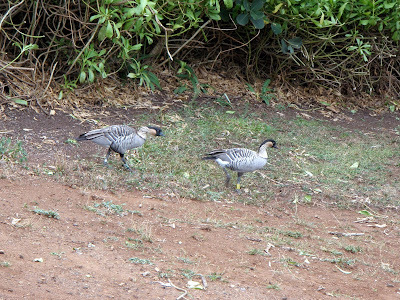 There are now about 800 wild Nene in Hawai'i and the numbers are rising with each breeding season. 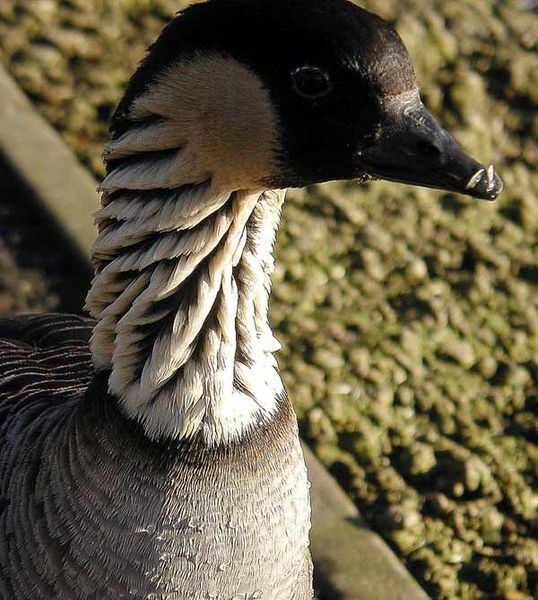 Somewhat similar in appearance to a Canada Goose except only the face, cap, and hindneck are black; and Nene have buff-colored cheeks. The front and sides of the neck appear to have black and white stripes. This is caused by diagonal rows of white feathers with black skin showing through. Males and females have identical plumage. It is also interesting to note that the dusty black feet of this goose are not completely webbed as in all other geese. Usually smaller than the Canada Goose (25" to 43"), the Nene ranges in size from approximately 21" to 26" inches in length. A variety of calls have been heard and described, mostly soft and apparently conversational in nature. The loudest and most commonly recognized call is very similar to that of the Canada Goose, a resonant "honk" or "ha-wah." 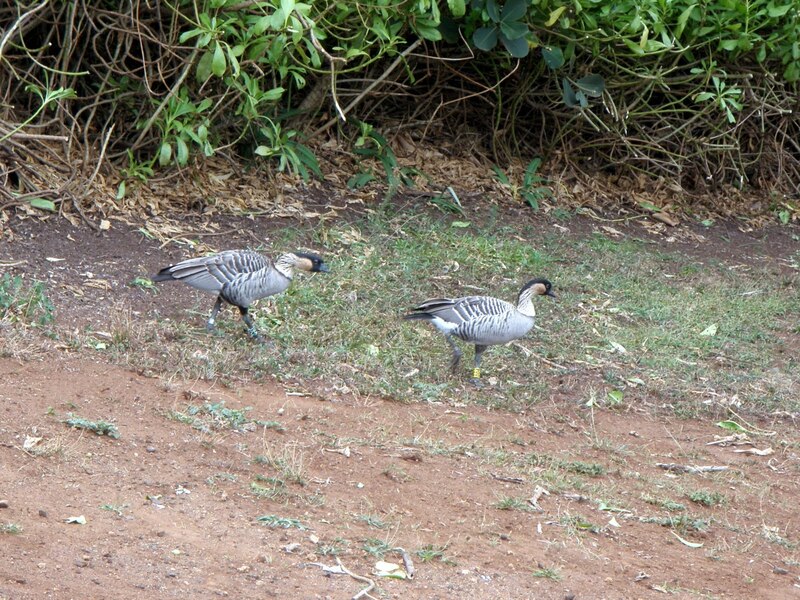 The Nene feeds on both native and introduced plants in the grasslands and slopes where it lives. The breeding season runs through the winter months, typically between November and March. Click Here to download coloring pages and info from the Honolulu Zoo. Your ingenuity and dedication to the field of Science never ceases to amaze me, Ellen. Am honored to learn/work alongside you! Thank you for making science fun for the kids. Thomas loves you class. Thanks for being so creative! !